The northeast section of Loop 375 is still a work in progress in terms of full freeway status. About half of this section of Loop 375 crosses Fort Bliss/Biggs Army Base and is a 4-lane freeway. 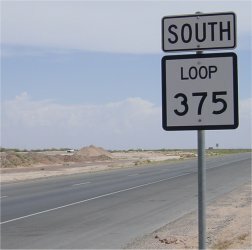 Outside of Fort Bliss, most of Loop 375 consists of feeder roads. However, work will be underway within a few years to complete most of the freeway main lanes in this section. The Fort Bliss military reservation is basically in its natural state. Unfortunately, the desert around El Paso is not very attractive. There is no cactus, only some scrubby ground cover. Of course, the roadway is fenced off for its full length through the military reservation. The section south of Fort Bliss between 62/180 and Interstate 10 is an urbanizing area with plenty of real estate development. Construction of the 12 miles of main lanes from 62/180 to Interstate 10, an approx. $25 million project, is funded and currently scheduled for 2004. 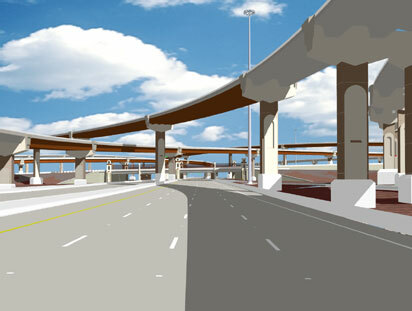 A full stack is planned for the interchange at Interstate 10 - see the offical TxDOT web site. An artist depiction of the future stack is shown at the bottom of this page. Construction on the 375 main lanes through the interchange could begin as early as 2002, according to the web site. At the north end, completion of the freeway is not yet funded so work will not begin before 2005. (high resolution 241k) A. Looking east from the US 54 overpass. This is a typical suburban strip mall area. Loop 375 is an urban boulevard at this location. The right-of-way is unusually narrow for a facility that is planned to be a freeway, but a four lane freeway will fit through this corridor. Photo taken 31-May-2001. B. The freeway begins just west of Dyer (BR 54). Photo taken 31-May-2001. C. Driver's view of the freeway near Dyer street. This view shows how the freeway can be squeezed into the narrow right-of-way. Feeder roads can be seen on both sides of the freeway main lanes. Photo taken 31-May-2001. (high resolution 118k) D. Typical view inside Fort Bliss. Notice that the indigenous landscape does not have any cactus, but is a scrubby ground cover. Photo taken 31-May-2001. (high resolution 161k) E. Between 62/180 and Interstate 10, Loop 375 consists of feeder roads. This view shows a typical section of roadway at an intersection. Photo taken 31-May-2001. (high resolution 94k) F. Intersection at Pellicano road, showing the feeder roads. Photo taken 31-May-2001. 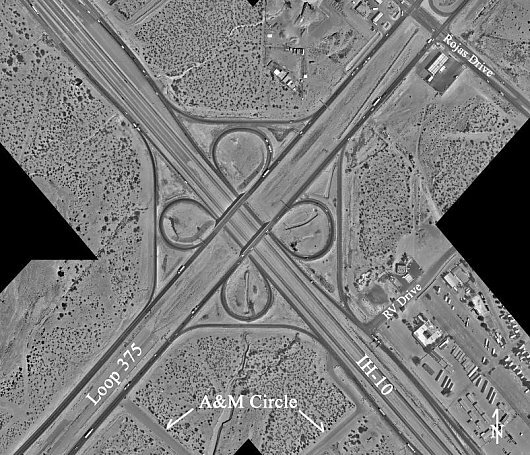 G. Aerial view of the existing interchange at IH-10 and Loop 375. A stack will be built here, probably in the 2005-2010 time frame. Aerial view is taken from the IH-10/Americas interchange web site. 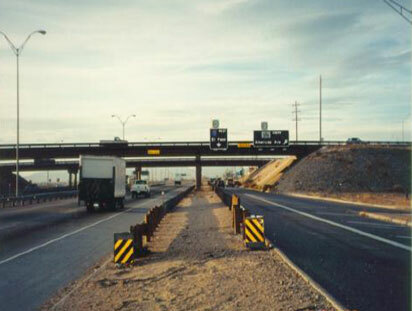 From the IH-10/Americas interchange offical web site, these photos show the existing Interstate 10 freeway and the planned stack at the Loop 375 interchange.